Free Shipping Included! Magnetic Refrigerator Calendar Dry Erase Or Wet Erasable White Message Board - Planner for Kitchen Fridge - 17x11inches by Delane at PPC Think. MPN: MC-001. Hurry! Limited time offer. Offer valid only while supplies last. 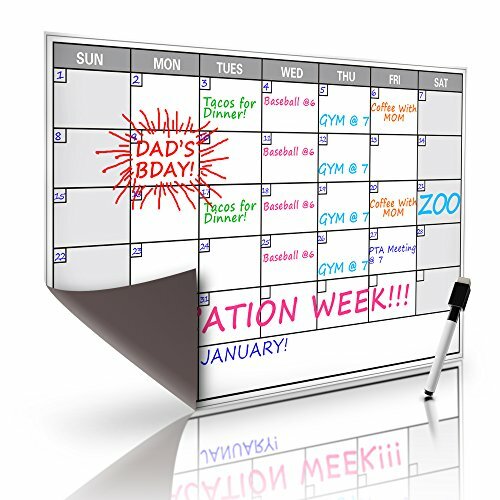 THE RIGHT SIZE - Your 17x11 inches calendar fits most refrigerator doors or sides. Each block is 2.25 x 1.5 inches which is plenty of room to write. PREMUIM DRY OR WET ERASE SURFACE - Designed for daily use. Works with WET erase pens for month long notes. DRY erase pens work best for short term notes. EASY-TO-READ DESIGN - Let others easily read your white message board as they pass by. Black lines and light grey weekend backgrounds add the perfect contrast to your colored notes. If you have any questions about this product by Delane, contact us by completing and submitting the form below. If you are looking for a specif part number, please include it with your message.